This impeccable Danish modern teak secretary is a quality construction designed by Johannes Sorth for Bornholm Mobelfabrik in the 1960s. 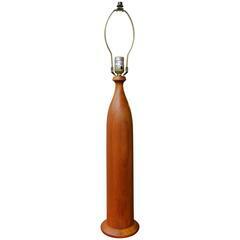 Made of teak veneer with all hardwood construction, it has so many handy design features! Firstly, the handy desktop pulls out to convert this to a compact desk unit, with a sweet central tambour door that wraps around the inside of the cabinet when opened, to reveal 3 smalls drawers with crossed circle pulls, one small adjustable shelf and pigeon hole dividers. Below the desktop are 3 drawers, all with birch drawer construction with dovetail joins and the first one is segmented. Finally, the upper tapering of the cabinet into the open bookcase section has two adjustable shelves with angled fronts, one which is less deep to allow for the taper. In excellent condition and an excellent amount of storage and function on a small footprint perfect for that little nook or condo living. Please note that the dimensions below are for the secretary with the desktop closed. When the desktop is open, the unit measures 23.5" deep.